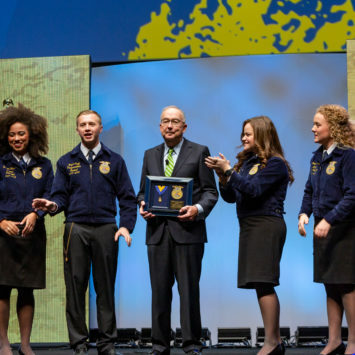 John Deere Chairman and CEO Sam Allen was the keynote speaker at the 91st National FFA Convention. His video opens with a humorous short sequence featuring an "image consultant." 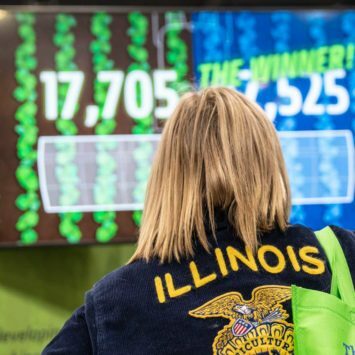 John Deere employees hosted a "game show" that tested FFA members' understanding of John Deere technology and innovation. 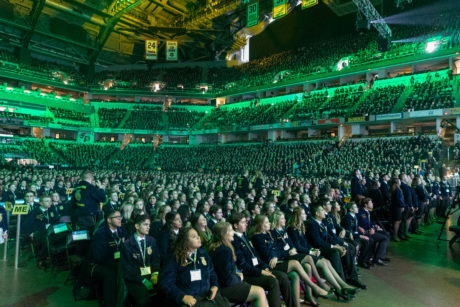 The 91st National FFA Convention was an overwhelming — and unifying — look forward. And, your eyes needed to be wide open to take it all in. Impossible to miss were the more than 42,000 FFA members in blue corduroy jackets, coming in waves … each swell bigger than the one before it. In total, more than 69,000 people attended the convention. There were the vendors — from college recruiters to car makers to manufacturers of agricultural equipment. And there were the must-sees, including a fortune teller named John Deere. 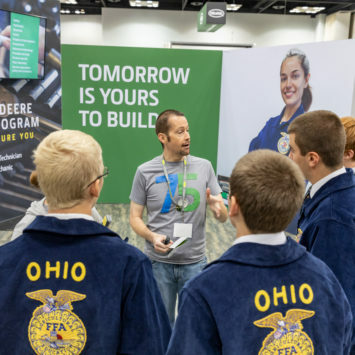 The blue jackets serve as an immediate identifier of FFA’s impact — a symbol of common beliefs. Of course, it is the names on the front and the locations on the back that make them unique. Eagle Point, Oregon. Deep Trail, Colorado. Lakeland, Virginia. Fifty states in all, as well as Puerto Rico and Virgin Islands, representing countless communities, linked by a love and understanding of agriculture. 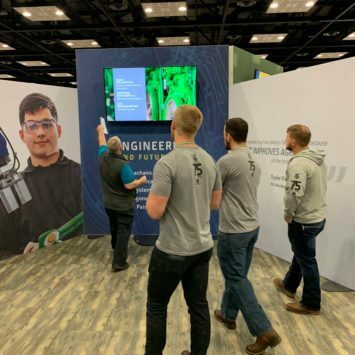 The John Deere booth featured an interactive game that tested FFA members' weed-killing skills in a game modeled after Blue RIver's "See and Spray" technology. 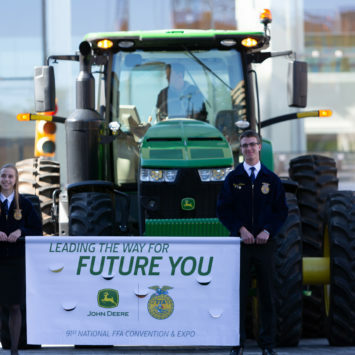 The four-day event held at Indianapolis’ Indiana Convention Center also was a celebration of John Deere’s 75 years supporting FFA and the future of agriculture. 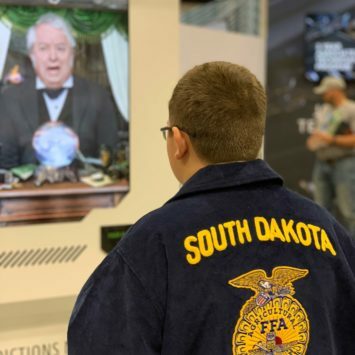 At three-quarters of a century, John Deere’s ties to FFA run deep. 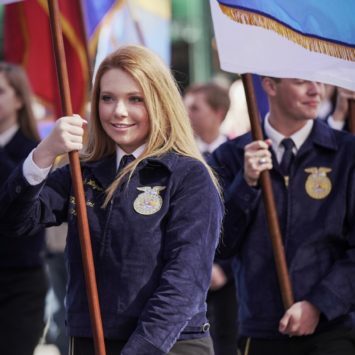 Today, FFA is a much larger organization with with more than 8,600 chapters. 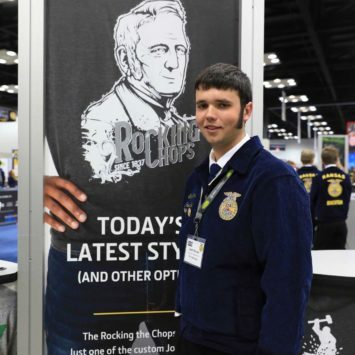 It serves students ages 12-21 in areas of agriculture and leadership development with 670,000 FFA members nationwide. 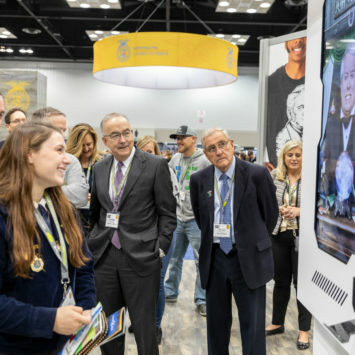 See highlights from the floor of the 2018 National FFA Convention. 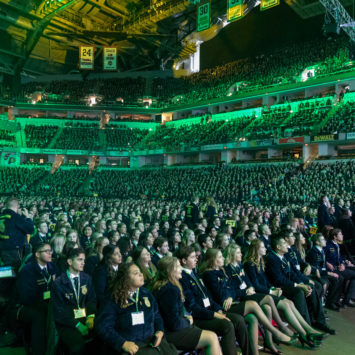 Deere’s Chairman and CEO Sam Allen delivers the keynote address to FFA members. 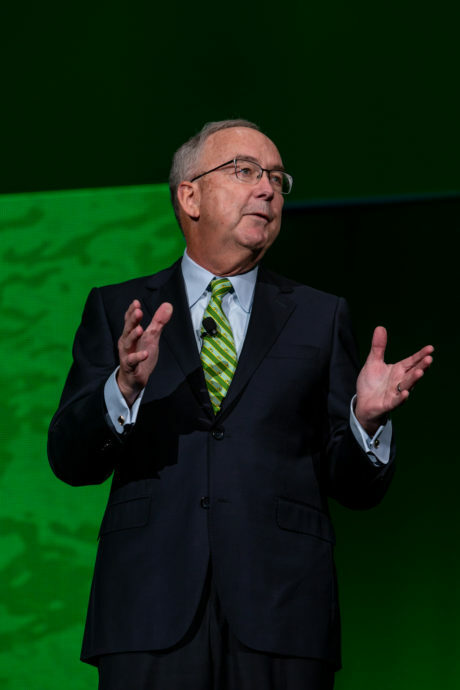 During his keynote address, Deere’s Chairman and CEO Sam Allen acknowledged the shared vision and goals of the two organizations. 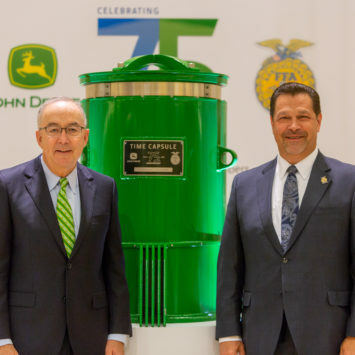 With the help of FFA, John Deere also captured the past by constructing a time capsule filled with iconic items from both organizations. 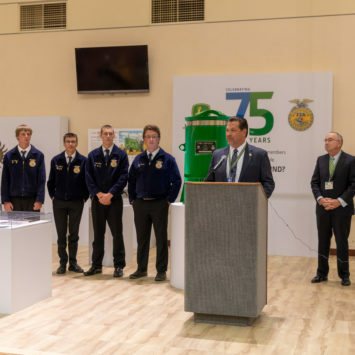 The time capsule was gifted to the National FFA Foundation and won’t be opened until 2093, 75 years from now. 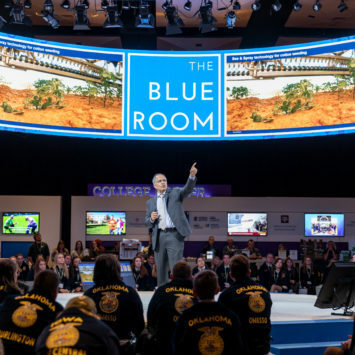 But it was the future that literally took center stage on countless presentations, whether they were student workshops or forward-looking topics like feeding the world in the technology-driven Blue Room. More than 42,000 FAA members attended the 2018 National Convention. 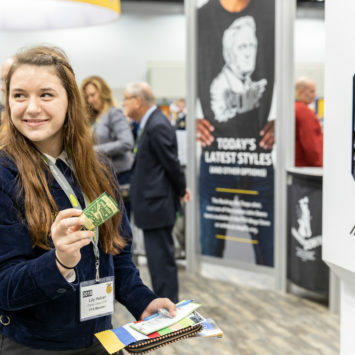 As much as the future was in focus, FFA members enjoyed the present, seeing old friends from across the country and taking the time to see what may change their work on the farm. 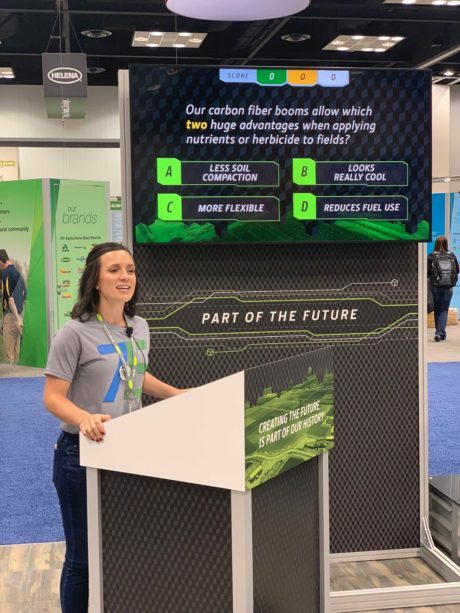 At 4,000 square feet, John Deere’s Future You booth at the 91st annual National FFA Convention provided both entertainment and truth in advertising. 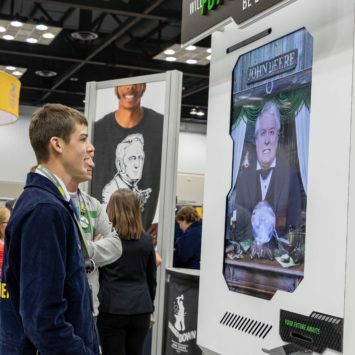 The Future You theme was backed up with career pods, interactions with Deere’s cutting-edge technology, and the star of the show – a fortune telling display featuring John Deere himself. The interactive display projected John Deere’s image on screen and spit out printed fortunes for anyone willing to interact with his quick wit. 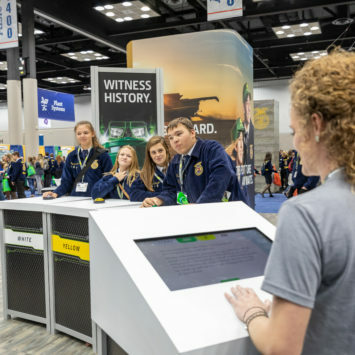 John Deere’s booth was one of more than 400 that occupied the Indiana Convention Center in Indianapolis. Eye-popping photography and graphics grabbed attention. 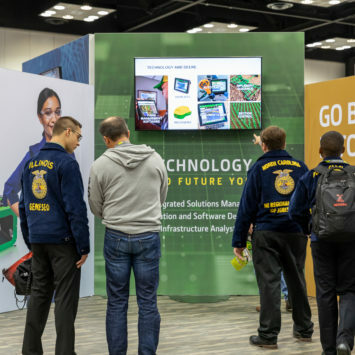 But the mix of learning and fun activities kept the Deere booth busy with a constant stream of attendees. 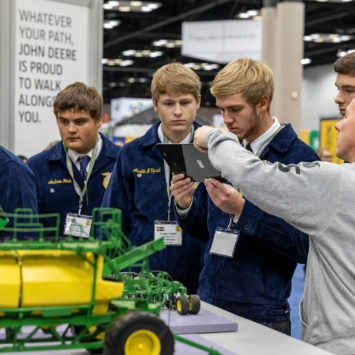 “I’ve looked at a lot of the technology here at the John Deere booth, and they have a lot of technology that I haven’t seen yet,” said Josh Schildmeier, a student from the Boonville, Missouri, FFA chapter. 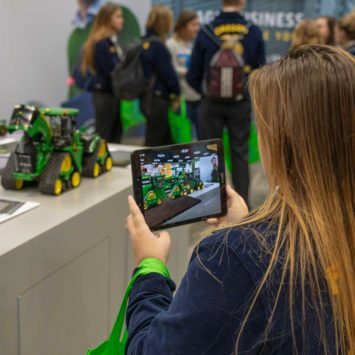 In addition to career pods – focused on agronomy, agribusiness, engineering, technology, and John Deere tech programs – interaction around Deere advancements in technology captivated both students and adults. 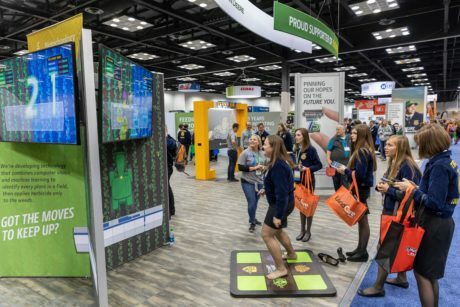 The booth featured a participatory game show with questions about Deere innovations; iPads that provided a three-dimensional look at products; and a weed stomping game that mirrored “Dance, Dance Revolution” and showcased the company’s “See & Spray” technology. 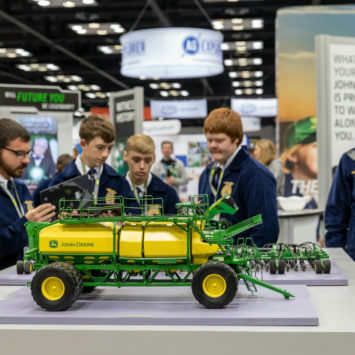 The John Deere as a fortune teller had a “Wizard of Oz,” man-behind-the-curtain feel to it as real-time, non-scripted responses left many guests stumped. “I’m not really sure what’s going on inside there,” Michael McKay said as he pointed at the display. “He knew too much about me,” the Corvallis, Montana, chapter student added.